Bill Cummings talked about his new book, "Starting Small and Making It Big," at BookEnds in Winchester. Bill Cummings first rose to prominence as a Boston-area real estate magnate, growing Cummings Properties from one small building to an 11-million-square-foot portfolio of commercial and office space. In more recent years, he has become known as a leading philanthropist. The self-published memoir details everything from his humble upbringing in Medford to his early career in sales and marketing to his entrée into the world of commercial real estate. But what Cummings is most proud of — other than his wife, Joyce, their children and grandchildren — is his philanthropic work. In 1986, he and his wife established the Cummings Foundation as a way to give back and support worthy causes.In 2011, they became the first Massachusetts residents to join the Giving Pledge, a philanthropic organization founded by Bill and Melinda Gates and Warren Buffett to encourage the world’s most affluent people to donate at least half of their assets to charitable causes. Over the years, the Cummings Foundation has awarded more than $200 million in grant funding to nonprofits in Greater Boston. Moreover, with the blessing of their children, the couple has pledged to donate nearly all of their assets by the time of their deaths. 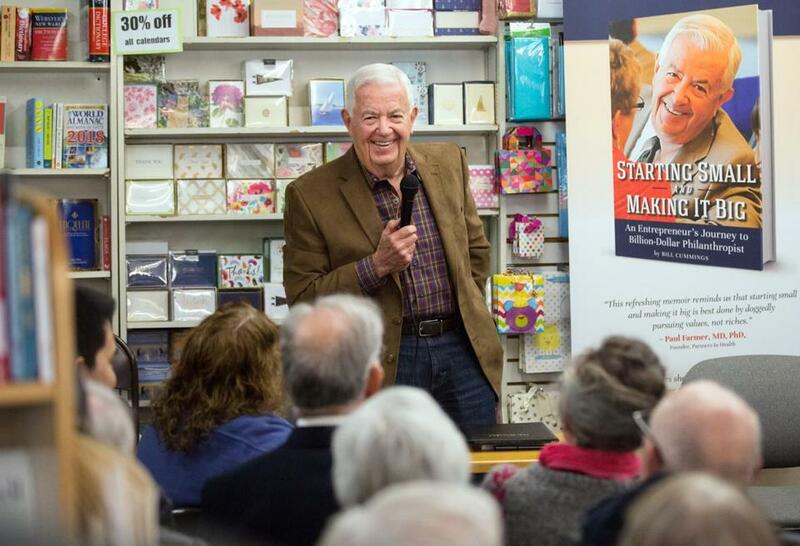 Speaking to an audience of more than a hundred, the newly minted author debuted his memoir earlier this month with a signing event at BookEnds in Winchester, the town in which he and Joyce have lived for the past 50 years. Shop owner Judy Manzo said it was one of the largest crowds ever to show up for an author event. Cummings greeted friends, neighbors, and employees past and present as he made his way through the rows of folding chairs. On a phone call two days after the signing, Cummings described the book’s inception. Initially, he was drafting an autobiographical component to be included in a local historian’s account of the United Shoe Machinery Corp. in Beverly, located on a 100-acre site that Cummings Properties purchased in 1996after the manufacturing company’s demise. But the more he wrote, the more he realized he had a much larger message than just how to develop commercial properties. Running a multimillion-dollar business and being a champion of philanthropy are certainly not mutually exclusive endeavors, as Dennis Clarke, president and CEO of Cummings Properties, points out. The beneficiaries of the Cummings family’s philanthropy include causes in human services, education, health care, and social justice, reaching everything from soup kitchens to homeless shelters to boys and girls clubs, primarily in Middlesex, Essex, and Suffolk counties. But the foundation’s scope became international after a 2013 trip to Rwanda to explore upgrades to the East African nation’s health sciences schools led to the development of the University of Global Health Equity in collaboration with Partners in Health. The University of Global Health Equity’s first campus will open in Butaro, Rwanda, this fall. Ultimately, Cummings said, success in business and philanthropy involve the same basic philosophy. The book can be purchased on Amazon.com, at www.cummingsproperties.com, or at BookEnds in Winchester. All profits will go to charities supported by the Cummings Foundation.